As a “by-product” of the Bollito Misto I made last Friday, I now have a couple of litres of delicious broth (brodo) in my freezer, neatly frozen in plastic bags, ready for me to take out and thaw whenever a craving for soup strikes. Yesterday I had a sudden yearning for Cappelletti in brodo – pasta filled with minced meat and ham, served in a delicious, clear broth. This yearning is quite natural, as it is usually eaten as a starter for the Bollito Misto, so in my mind these two dishes sort of belong together. It is still freezing cold in Denmark, spring is nowhere near us, so I thought a nice, warm soup would be nice (and easy) for dinner yesterday. Boyfriend has caught a cold, and I am still recovering from mine, so it seemed like perfect, nourishing comfort food to serve. The broth used for Cappelletti in brodo is homemade and quite hearty. The key to a dish as simple as this, is quite simply the quality of the stock – this one is made of different kinds of meat, left to simmer slowly with veggies, herbs and spices for a few hours. In Italy, around the Reggio Emilia area, the stock for Cappelletti in brodo is traditionally made with capon (I had to translate this with Google Translate, hope I have the right word) but I had to make do with the meats I could source here. So. I had no hopes of finding authentic Cappelletti around here, but I got lucky and found them in a local supermarket. Cappelletti are small “hats” of pasta filled with lovely minced meat and prosciutto (ham). Traditionally these are handmade and should be no larger than a nail on your little finger. This is the claim of Gigi, my Italian friend from Reggio Emilia, and he – as all Italians – has a lot of opinions about food. 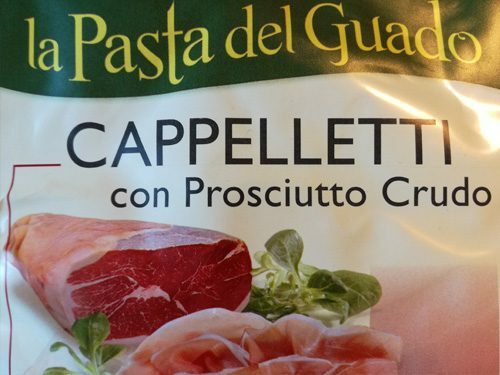 It might be fun to try and make the Capelletti myself, but I haven’t got the patience it seems to require. If you feel up for making them yourself, have a look at this video for inspiration. Anyway, I found the pasta, and from there it was simply a matter of bringing the stock to a boil, grate some Parmigiano Reggiano (yes, let’s do this properly), boil the Capelletti in the broth for a few minutes and then serve over the grated Parmesan, *mixed with an egg, and some crushed black pepper. *This last part with eggs and black pepper, is not strictly part of the tradition, but I like to shooosh up any clear broth with it. It lends body and creaminess to the broth, and it’s just darn delicious =). I get my eggs from a colleague, whose parents keep free-range hens, and I have no qualms about using them even slightly raw. Feel free to omit eggs, it you it makes you uneasy. You’re going to need good quality stock – this is one recipe where you’ll really thank yourself for making it yourself. It’s quite easy and you can make a big batch and freeze it in portions – it makes a great base broth for a variety of soups. Bring broth to a boil and add the Cappelletti. They should boil for approximately 5 minutes, but you might want to check cooking instructions on the packaging, as cooking time might vary depending on size of the pasta. Taste often to check consistency – you still want the Cappelletti to be al dente. While broth is coming to a boil, grate cheese (approximately 1 tablespoon per serving). 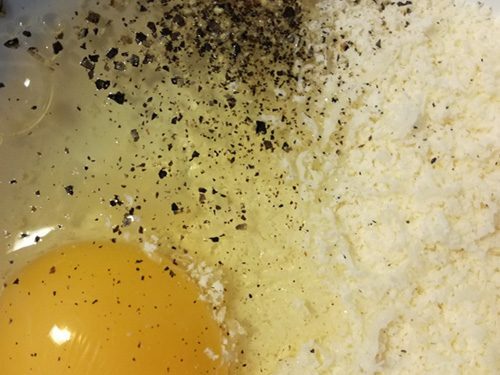 Mix cheese and eggs with a fork until you have a smooth mixture. Crack a few peppercorns with the flat side of a chef’s knife. Place it over the peppercorns and press on the blade with the heel of your hand. Add the pepper to the cheese and egg mixture. As soon as the pasta is cooked to perfection, ladle spoonfuls of Cappelletti in brodo over your cheese and egg mixture, and mix well. Serve with great bread. Buon appetito. 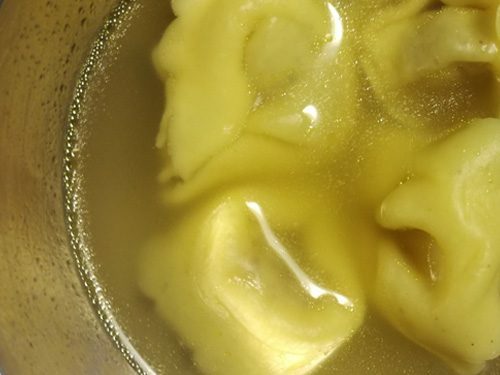 As always – feel free to let me know if you make Cappelletti in brodo. I’d love to hear your opinion.